He is a very manly type of guy. He doesn't even like to shower lol, isn't as bad as it sounds. Well I know I can for sure take a spiritual bath. When I am done with my bath do I just add a bit to like the rinse water in the laundry? Is there any other way to use it? I want it to be as effective as it can be. I have a small plant by the kitchen window that I can water with it. Are the spiritual baths very powerful? If I take the bath myself should I still light the candles dressed in oils? more power vers less power is an amature question... they work together let me ask you this, what will you do to make this work? you respond then I give you the advice from your reader, therefore if you want this to work that is what you need to do. the bath ok sure your big I get it, lost of ways to work it, add to his bath, add to his laundry, add to the bed laudry. put in a spray bottle and spray it. Mix it in a squirt bottle and tell him you want to shower together and spray it all over as you shower... you get the idea. you should do as you were told from your reader.. the more u get him involved in the process the better.. if your underlining question is can I bath myself and not him and get the same results the answer is no. can you be sneaky with bathing him and yourself and get the same results the answer is yes. sounds like you are new to all this so I think you may want to seek a worker out and maybe ask them to do the work for you or along with you. hope this helps! Yes I am new to this. I would do anything to make this work. That's why i am always on here asking questions and give ny heart into my work. I just needed advice. I can take a bath and then be sneaky about bathkng him. i never said that I couldnt do that. That's why I was asking for suggestions on how to do this. I am committed to making this work. I am spending the last of my money on stuff from OM and stuff for a honey jar, so i have no money until I start my job to hire him and help me out with spells. I do believe that I can do this on my own I have done a ton of research and I do feel confident that i can make this work. Some of my candles had to of worked cause there are signs and movement from him, but candles are just not enough in this case. So once my products come from LM I can start my bath process. I am starting the honey jar tomorrow. So thank you for all the advice. Axle1988 wrote: He is a very manly type of guy. He doesn't even like to shower lol, isn't as bad as it sounds. Well, he uses deodorant, I suppose? Maybe foot powder? And certainly soap of some kind? All of these can be dosed with your bathwater, even if you just smear a little on the end of the deodorant stick or bar of soap. A few drops on his comb or hairbrush, or in his hair products if he uses them. Well I know I can for sure take a spiritual bath. When I am done with my bath do I just add a bit to like the rinse water in the laundry? Yes, exactly. You could even put a little -- a capful, maybe -- right in your fabric softener. Is there any other way to use it? I want it to be as effective as it can be. YOU CAN COOK WITH IT use very small quantities in his favorite dishes. I have a small plant by the kitchen window that I can water with it. Nice! It'll radiate your intent into the room, all the time. A fixed houseplant is kind of like a permanent candle that way. 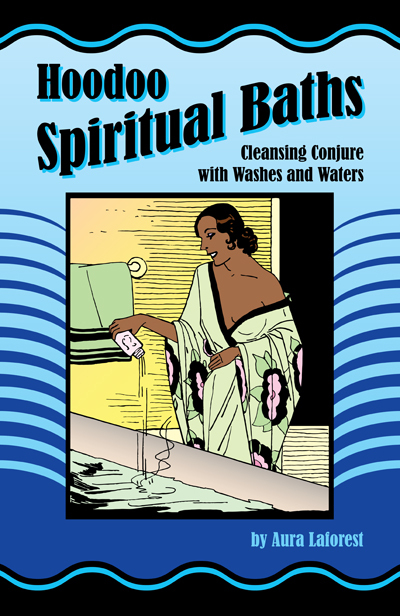 Are the spiritual baths very powerful? If I take the bath myself should I still light the candles dressed in oils? Yes, if you can do it without him getting all frightened about being hoodooed. Belt and suspenders, you know. Thank you Miss Michaele. You explained everything perfectly and in a way that was nice and calm. I do not think he would be freaked out by candles or anything like that. I have always burned a mass amount of candles, even before i knew about Hoodoo. He does use deodorant in the morning. He has very short hair, so no hair brush or comb. He takes a shower everyday so i could put some in his shampoo, and some on his bar of soap. I can also use some in the fabric softener and in the plant in the kitchen. Now with the peace water do i just sprinkle that around the house and say a prayer or petition? This wont effect my dogs will it? I have 3 large dogs so just making sure they wont be hurt. Axle1988, it sounds like you have a clear understanding of the work you need to do. You can sprinkle the Peace Water around the house AND mix it in with your bathwater (not so sure about putting lots of Peace Water on the houseplant, though). Axle1988 wrote: This wont effect my dogs will it? I have 3 large dogs so just making sure they wont be hurt. I'm aware that this is a very old post, but these references are so valuable that I'm glad they are available as us newbies come along. I just wanted to say that your post Ms. Cat was great on this topic. I am often confused by what is traditional and what is just one of so many products available on the internet. Also, to give an informed and eco-conscious reason for not carrying a product is of course not required, but so very helpful in making a decision of whether or not to seek a product from another source. In this case, it sounds like it is certainly a more thoughtful and aware decision to go with an herbal replacement especially as one is so readily available at Lucky Mojo. Jordan733 wrote: I am often confused by what is traditional and what is just one of so many products available on the internet. I would suggest that you start researching hoodoo for yourself and you will soon learn hat is traditional and just a product on the internet. It will become quite clear in a very short amount of study. Research authors of books you come across to see what they gain from publishing. Look into books published before 1980. Time and research will be your guide. Best of luck. 2- disposing of at a crossroads- is going to a crossroads right near my house okay? -should I be in the middle of the road when disposing, or is standing on one of the streets okay? thanks. I was doing a cleansing bath for road opening. I'm still pretty new to ritual baths, so I'd love to find out if I did this one "right." It was about 5 a.m., still dark, and I text messaged my mother (who is downstairs) and asked her to not disturb me including when I walked outside. I took my normal shower and drained the tub. I then placed about half of the Clarity bath crystals into hot water in a plastic container. I took a drop of Power oil and put it on two white tea light candles on the side of the tub (so I could step out between them) and lit them. I started filling the tub with some hot water. I then read Psalm 141 (King James Version) from my Kindle while pouring the Clarity/water mixture upwards onto my body. I then took the container, placed some of the bath water - including my essence and herbs - into it and placed the lid on the container. I dried off by air and prayed the Serenity Prayer. I then stepped out of the bathtub, pinched out the two tea lights, placed on my robe, and carried my container of bath water downstairs. I walked out my front door and threw the water over my left shoulder toward the sunrise/East. Then I returned to my bedroom feeling very calm. I'm pretty sure I did this "right" but just wanted to be sure. Thanks! Your spiritual bath sounds good. I would just love it if Lucky Mojo offered the bath crystals in a larger size! Since I like to do continuous personal cleansing and protection work, I go through them quite quickly. I use them in the bath and in my laundry, so the oil doesn't work too well for me there. So far I have only found the 12 pack special so I may go via that route for now. Hello, I'm very new to hoodoo. I have few questions regarding Baths. 1) I don't have tub, only shower, can I still taking purification bath? 2) How to take bath water, with shower? 3) I don't have yard, or potted plant, how can I dispose the bath water? 1) Yes. The answer in many variations is included on the very first page (and subsequent pages) of this thread. Please read it in its entirety as it will provide you with lots of useful information and ideas. 3) Crossroads are usually good. Usually over your left shoulder into the rising sun and then you walk home without looking back. But again, you'll find different variations within this thread. I love the 12 pack special too. I would like to buy 13 herbal bath and also van van. Also, I need to know how to use them. should i just pour them in the tub and immerse and then wash myself with another water? Or, is it that I'm not supposed to wash off the van van with fresh water after using van van??? What I do is take a shower, wait about an hour, then take the herbal bath (according to the instructions on the webpage that I just gave you), and then anoint myself with whatever oil that I deem necessary for my intentions. Yes, follow the instructions. I take a shower before taking a spiritual bath. Don't shower again for 24 hours afterwards. thank you so much, is it same process for van van crystal bath too? is there any specific psalm I should recite when I take herbal bath? Colette wrote: Yes, follow the instructions. I take a shower before taking a spiritual bath. Don't shower again for 24 hours afterwards. it says:' add the liquid to your bath. ", does it mean i add boiling water to tub that is already filled with water? Yes, that's what it means. You're right! Has anyone used the bath crystals in an energy efficient (front loading) washer? Where did you put them- in the drum with the clothes themselves, the detergent dispenser, etc? I love all the herb and root chunks but am afraid they'll get stuck in the lines and I'll have to explain myself to the landlord, lol. Thanks. Hi Liz, I had a front load washer in a place I rented and HATED it. You can't use regular soap in them and there isn't enough water ( in my opinion ). Plus, after a while, they have that funky smell to them because they never drain properly. I was so glad to get back to good old fashioned top load washing! Anyway, when I was using it, I increased the water level to the highest it would go ( with the programing thing ), and I added a TINY drop of Chinese Wash in with my detergent in the little tray that slides out. Likewise, I added a bit of Florida water to the Rinse/softener part of the tray. With the washer I used, you had to put everything in that little tray before the wash program began ... soap, softener ...bleach ... magical products. I assume the one you are using works the same way. So ... I would make a "tea" out of the bath crystals ( strain out the herbs with a coffee filter ) and pour a little into the detergent holder or rinse/ softener holder of that little tray before you begin the wash cycle. Hope this helps. Hi Liz, I don't have a front loader and I don't really know how they work, but I add the bath crystals right into the stream of water as the washing machine is filling up. I put my soap in and then add a pinch with a prayer. I have no idea if this helps or not because I am unfamiliar with front loaders. If, due to circumstances beyond your control, you miss a day of bathing - do you start over from the beginning? From Day One? Hard to say Bananas+ since we don't know what bath you're doing nor what your condition is nor what ''circumstances beyond your control'' really means. If you have been prescribed a set number of days of work by a root doctor and you miss one day, then it's best to consult them and ask. If it's within the context of a full spell, some would start over, some would keep going, but do keep in mind what it usually says about the commitment to the spell (again, that depends on the ''circumstances'' which led to the skipped bath). Give us a bit more information and hopefully then we can better advise. I've been advised to do a 13 herb bath for 13 days to help uncross love conditions and would have been on day six yesterday except that I had to pick up a friend from an abusive ex's house and she stayed with me. I live in an incredibly small space and rather than perform a ritual that might wake her, I left for work without bathing and let her sleep. Given that you could have done the bath but chose not to, I would do the series again - but do consult with your rootworker to confirm, they may through divination offer you a differening opinion. I admire your picking up and helping your friend and commend you on sharing your space with someone in need. So that you can continue throughout a situation like this, try explaining to your friend that you need to take a bath before sunrise. No more specifics are necessary, and the explanation allows you to proceed nonetheless. Thanks for your help, aura. Im sure this question has been asked before, but I have been reading through posts for 2 days and haven't found the answer. What is the correct way to wash my house. I am trying to do road opening work to remove blockages..I have washed down my house last year, but im not sure that even then I did it right. My plan is to wash down my house with van van and chinese wash, and then do a road opening and van van bath. I know I am to start at the top and back of my house and work my way down and out, but my question is..do I just wash down walls? Or walls AND floors...or just floors? I have carpet and pretty much every room is heavily furnished so do I have to move furniture around? do I need to actually wash the entire wall? Or could I just wash baseboards? And how do I dispose of this water? Also, I read on the van van thread that the bath is typically taken 3 days in a row....should I do that as well? or is just one day ok? Well, I usually de-clutter and vacuum or sweep, then start the cleansing. Pay attention to corners of the room starting at the top. I've used a rag to wipe down the walls and in another house I used a swiffer with Chinese Wash on it to go around at least the top edge and corners of the walls. You can wipe down the floor molding too, then mop the floor. With carpet, you can use clothes pins to attach a rag ( dipped in Chinese Wash ) to a broom and sweep the carpet. Some folks add Chinese Wash to their steam cleaners when doing carpets. Don't forget to open a window when you clean so the bad can escape. I don't move furniture usually, but if you have a big issue and want a thorough cleansing, perhaps you should to make sure no dust bunnies are under the sofa or bed. Try to reach under big pieces with a mop or use incense to get cleansing smoke into places where the mop can't get. Use incense too - open closet doors and drawers to smoke out crossed conditions. I have had good results from uncrossing incense and cleaning with Chinese Wash in my Pine-sol. Don't forget to seal after you cleanse. Good luck! Thank you Moonbreath!! But now I have a new question...seal it??? What does that mean?? This means to add an oil or other protection product after you do the cleansing. That way, other negativity cannot enter. Blue, they say burn a white candle with FWP or Blessing Oil on it in each room when you finish cleaning to seal it. I usually have one candle which I move from room to room as I finish. Then, after getting rid of the dirty mop water, I go through the house with FWP and Blessing incense and make a small cross or 5 spot on each window and above each door with Florida Water or Van Van oil. I also sprinkle salt along the thresholds. You can sprinkle salt or whatever sachet powder you are working with ( Money Stay with Me, Law Keep Away. etc ) in the corners of each room and under rugs. Just some examples .... Hope they help. How old does the tree need to be in order to use it for a negativity wash? I know it needs to be an older, healthy tree, but how old is old enough? And is it okay to dissolve only half the crystals the first time you open the packet in order to get more than one use out of the packet? I have no idea on how to guess the trees' ages so, you will have to use your judgment. Thanks again. I'll go the crossroads if it's easier. also, I think I should include that I am interested in helping others and before I try my first spell, I think i should maybe have or do some type of cleansing. Unfortunately I don't know which one. Any help would be greatly appreciated, and thanks in advance. Hello Chosen2Conjure, for your situation with "no work/money problems" and your desire to "prosper" I would also include Road Opener products to remove the blockages you feel and also clear the way for success. For your settled conviction that someone is working against you -- check it out with some divination first. If divination confirms your fears, go straight to Uncrossing. Take a proper Uncrossing bath. Also, spike your grooming and cleaning supplies with a small quantity of Uncrossing crystals dissolved in water, so that you are maintaining the Uncrossing work every time you groom yourself or clean house. Although an Uncrossing bath may not be strictly necessary, it won't do you any harm. If taking an Uncrossing bath still does not ease your worry, it may have a psychological basis which therapy might help. Now, if you do find physical signs that you have been jinxed -- a bottle of War Water broken at your front door, for instance! -- sprinkle that mess with Jinx Killer, clean it up, and throw it away. Often times I am out of towns and in situations where only a shower is available to me. 1. Is it ok to use bah crystals in the shower?. I am meaning will it be as effective? 2. Could I use specific herbs and make into a bodywash and uise that way? clarkie, please read the thread your post was moved into and also this "Hoodoo In Theory and Practice" page. Your questions are asked frequently, and we recommend that you read the background material. 1. Yes. Dissolve them in warm water and pour, or, if you prefer, use hem as a salt-scrub. 2. Yes. Boil them first to make a tea, cool them, and pour. catherineyronwode wrote: clarkie, please read the thread your post was oved into and also this "Hoodoo In Theory and Practice" page. Your questions are asked frequently, and we recommend that you read the background material. Thank you so much salt scrub will work for me. I don't remember if this is something I've read through this thread or if I thought of it out of the blue, but I decided to dissolve some bath crystals in cooled boiled water and put it in a spray bottle, and in the morning before I dress to go out, I spray my clothes with the bottle lightly, mainly protection uses, has anyone else tried this? Yes, this is a very good idea! People call that a spritzer. Hello, I am planning on using the mineral bath crystals. 1) I have read in the forum that you only shower after doing negative work. Is this true? 2) I would like to know if it is okay to shower after any kind of work love, blessing, protection, etc.? 3) I read you that usually you are to wait 24 hours but I have really sensitive skin. I did one bath in the evening and by the time I got to work the next day I was extremely irritated. I had to come home and shower on my lunch break. Any help would be appreciated. I am a newbie . Thanks so much. 1) This is not true. 2) Most rootworkers recommend against this. You would just be washing off the work you took a lot of effort to put on. A-Don't use herbs, herb-teas, herb-baths, or mineral baths (under any circumstances) if you are allergic to them. B-If you're not allergic but only sensitive, decease the amount required in the package instructions; dilute the baths more. C-Put in a spray bottle and lightly spray yourself in the shower. Whatever you decide, do what's best for your health. Hi Miss Aida. Thank you for your response. Yes I had read the page on baths prior to but I will be reading it again. I poured the entire package in my basin. I will most definitely use less for my next bath. I do not believe it's an allergy, I just have really sensitive skin. Time wise is 24 hours the length of time I should wait to shower? Thanks again. Waiting about a day (24 hours) before showering is fine And definitely dilute next time round - the baths are potent. Dr Johannes wrote: If you are thinking of breaking the old time tested recommendations of the tradition even BEFORE you have done your work and especially as a beginner, you might want to reconsider. If you are looking for good results and want to follow and preserve the folk tradition of Conjure that is. It is better to follow the recommendations. Reprioritize your agenda for a week. Then be strengthened by the accomplishment of having performed a real spell and be proud of you having become a true carrier of the tradition. That wields lasting results in terms of confidence and strength to every spell you do, regardless of any later results from the spells themselves. I have found that doing everything possible to follow the directions that come with LM spells and products increases my success level considerably. If I do it kind of like the directions say, I get a small to moderate success rate. For every additional direction I follow exactly my level of success goes up. So, if there are 10 steps and I can accomplish 8, 9 or 10 exactly, I have more success than when I only accomplish 4 or 5.